Years ago, before NASCAR was mentioned in the same breath as the NFL or Major League Baseball, young drivers were attracted to the sport not because of the possibility of fame and fortune, but because they loved to race. They would spend countless hours in the shop working on their cars and their ultimate weekend involved being able to run in multiple divisions, maybe even at multiple tracks, and barnstorm the county doing what they loved. 18-year-old Andy Seuss might be living in the racing world of 2005, but his attitude on the sport is a refreshing throwback to those simpler times. He races as much as he can with his team of family and friends and he gives 100 percent each time out. He’s not afraid to get his hands dirty and he’ll race any type of car that he can get into the seat of. This season, Seuss will focus most of his energy on his #70 Modified, owned by NASCAR Busch North team owner Jerry Morello. Instead, Seuss ran the full season in the True Value Modified Racing Series for Morello after the two joined up with each other early in the year. That led to a new plan, which also didn’t quite work according to, well, the plan. The Modified team turned the corner late in 2004 and Seuss hopes to continue that improvement this year in all the cars. Seuss’ passion for racing can be seen in his choice of a favorite NASCAR Nextel Cup driver. He’s not swayed by who has the most endorsement deals or who has made the most appearances on television. Instead, Seuss pulls for a guy who hasn’t won a Cup race in over a decade, but is a true racer. Miller will be driving the Bobby Jones-owned #88 at Nashville. And closer to home, Seuss also has a ton of admiration for a driver he has raced against – Ted Christopher. The New England driver has made a name for himself by being willing to race anything and has won races in NASCAR Modifieds, the NASCAR Busch North Series, PASS Pro Stocks, ISMA Supermodifieds and just about anything else with a steering wheel. So with Seuss looking up to those guys, his focus might be on the Modified in 2005, but that doesn’t mean that he won’t race anything else. The team sold their Supermodified, but plans to run the Late Model at Lee occasionally, when it doesn’t siphon resources from the Modified effort. Even though Seuss knows this is a great idea, the racer in him has mixed feelings. Seuss is also candid when it comes to his career goals. He wants to do the best that he can at every level of the sport and then think about moving up. And like any true racer, there is one thing that Seuss hates more than anything – rainouts. But, he even has a plan for that. It's a new season with a new number for Seuss. 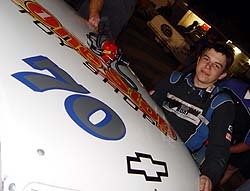 He will switch from the #10 to the #70 in the True Value Modified Racing Series for 2005. Seuss admires Ted Christopher, but probably didn't appreciate this bump during Florida Speedweeks. Seuss isn't afraid to get his hands dirty. Working in the shop with his crew is almost as enjoyable to him as being at the track - well, almost.